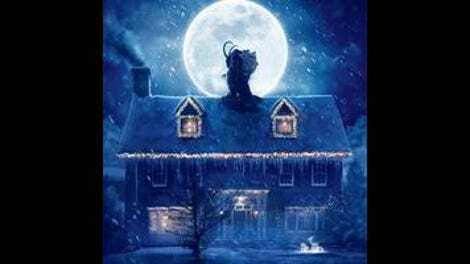 Neither particularly frightening nor especially funny, the Yuletide horror-comedy Krampus scrapes by on the novelty of its setup, in which an antagonistic Christmas movie of the Family Stone variety is hijacked by beasties straight out of a Full Moon entertainment. That might sound like foolproof fun, but the film has only one really good moment of anarchic nastiness: two preteen legs, jutting from the toothy maw of some elongated, oversized clown doll—a jack out of its box, gulping down children. 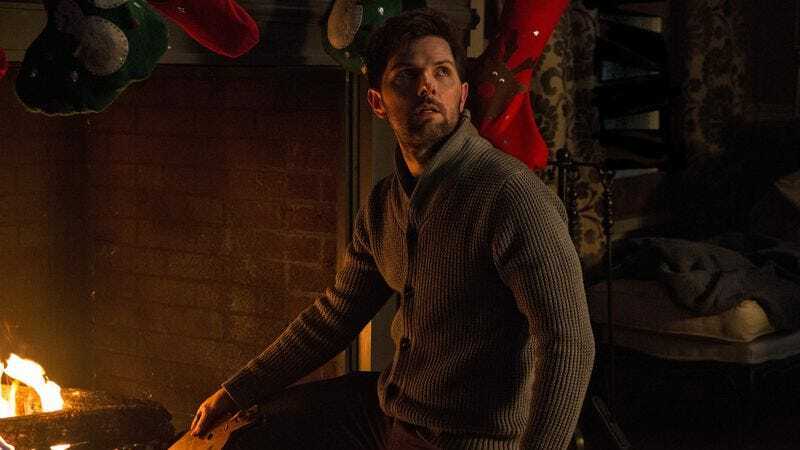 Otherwise, this holiday-season fright flick never leaps far enough outside of its own box; the movie flirts with going full-on monster mash, with really cutting loose, but the mayhem is too little, too late. Like a lot of films that come packaged as antidotes to seasonal cheer, Krampus is really a stealth Christmas carol, smuggling a pro-St. Nick message in the guise of counterprogramming for Scrooges. It’s a good ruse: The opening scene is a slow-motion lambast of last-minute shopping sprees, parents and children alike scrambling over each other to the ironic accompaniment of a Bing Crosby staple. The hatefulness holds as we meet our unlucky, unhappy family, brought together through annual obligation. Dad (Adam Scott) is a workaholic, Mom (Toni Collette) is a pill-popping stress machine, and the teenage daughter (Stefania LaVie Owen) is… well, an eye-rolling teenage daughter. That’s just the tip of the dysfunctional iceberg, as the cozy suburban home is soon invaded by dull, cruel, uncouth relatives. It’s enough to make the resident Kevin McCallister (Emjay Anthony) tear up his letter to Santa, accidentally summoning the big man’s shadow, a hooved hulk of Alpine folklore who comes charging down chimneys, malevolent minions in tow. From the always reliable Scott and Collette to Fargo’s Allison Tolman, the cast is almost uniformly overqualified; even David Koechner, adding another gun-toting jackass to his résumé, can’t resist investing his character with a little humanity. Of course, the real stars of the show are the toy-box terrors. Krampus boasts some truly terrific practical creature effects, including that aforementioned bozo worm, a razor-toothed teddy, and the titular monstrosity himself. Trouble is, these first-rate fiends aren’t just sparingly employed, but also frequently obscured by poor lighting, slapdash camerawork, and frenetic editing; it’s hard to say, additionally, if scenes set outside, against the white blanket of a blizzard, are intentionally or accidentally difficult to parse. It’s all rather clumsily staged—a real handicap for horror, and a surprise coming from director-cowriter Michael Dougherty, who achieved higher quality on a lower budget with his anthology film Trick ’R Treat. Juggling genres is no easy feat, especially when they’re as disparate as monster movie and holiday dramedy. It takes a spark of mad, macabre genius to make that mix work. Joe Dante had it. So, too, did Tim Burton, back when he was pitting a different clan of bickering housemates against unholy forces and putting his own spooky spin on Christmas festivities. Krampus has some stray moments of wicked inspiration, including an animated flashback that feels like it was yanked from a more serious and elegant picture. But on the whole, the film suggests that Dougherty won’t be joining that rarified company just yet. It’s tempting to blame the PG-13, until you remember what Gremlins did with a PG. Now there was a Christmas creature feature with some bite.